Ras G - Dance Of The Cosmos. Vinyl LP. Bleep. 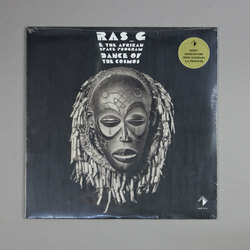 Dance Of The Cosmos is the first record on which Ras G tries his hand at deep house. Here we see the Californian beatmaker (with The Afrikan Space Program in tow) funnel his particular strain of Afrofuturism through the kind of atmospheric 4x4 grooves one more commonly associates with Theo Parrish. Cuts such as ‘Long Gone’ and the Dance Of The Cosmos title track are classy Midwest rollers, and the former’s thumb piano melody gives us a neat link back to Ras G’s earlier celebrations of diasporic black culture. This connection is even stronger on ‘Harambee 2 The Sun’ and ‘Push It Along’, swinging tracks which foreground black voices and black stories.